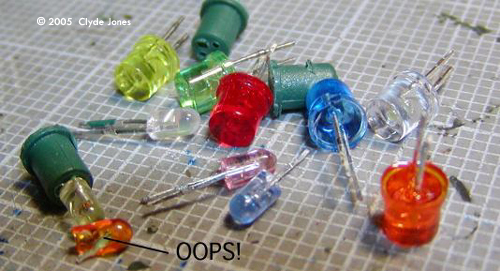 ^ First step: CUT OFF THE PLUGS! To buy LEDs? Yup! They come disguised as ‘Christmas Lights’ - the “Forever Bright” line is especially good. And they are the subject of this article. Why bother? Cost. A string of 75 BLUE LED lights costs $10 on sale - and up where I am there's a $5 rebate per string for "Energy Saver" lights. So that's five bucks for 75 LEDs - or about 7 cents per LED for the expensive BLUE ones. Cheap. Oh, one other neat thing. The sets come in 'shelf display boxes' which are disposable and which have sets of WORKING LEDs in the front side, along with a push button to light 'em up, and a 6 volt battery pack. The boxes are meant to be thrown away. THROWN AWAY.... Hint hint. So far I've 'scored' two boxes. Free. Nice, that. With a life time of 100,000 hours the LEDs are a natural for Christmas lights - put ‘em up and don’t worry about ‘em for the next 10 years or so. Early attempts at LED holiday lights just replace the little, fragile, easy to burn out micro incandescent bulbs with LEDs - just LEDs stuffed into little plastic buds and jammed into conventional sockets. Just begging to jar, wiggle, squidge or bump loose in the socket. They were very easy to re-use for other purposes, though - just straighten the bent over leads and pull ‘em out. Then the manufacturers got smart: if you don’t have to replace the LEDs, don’t make ‘em removable at all. So this years crop is firmly soldered and molded in place. They can be - persuaded - to come free for use in models. It does take a little work. There are several styles of Forever Bright LED light sets. First there are sets divided according to color - mono-color or mixed color mainly. The offered single colors are RED, ORANGE, YELLOW, GREEN, BLUE and WHITE. Mixed sets have R/O/Y/G/B LEDs. Quite nice color too. Then there are different shapes of the injection molded bubbles around the LEDs: globes (about 1 inch faceted spheres), big “flames”, small “flames”, and 1 inch long ‘icicle’ shapes. In manufacturing, the LEDs themselves are mounted into a ‘bud’ or carrier that has the LEDs leads sticking out. These leads are soldered to wires, and then the assembly is (apparently) inserted into one kind of molded shape or “bubble” in clear/tinted plastic. 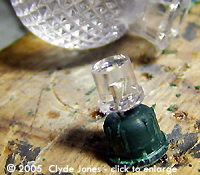 Then a ‘socket’ is molded around the wires, the ‘bud’ and the base of the clear bubble, anchoring all firmly in place. Something to note: different bubble shapes house different SIZES of LEDs. Handy, if you want different sizes for different projects. For instance - “Globes” or spheres have 5 mm LEDs inside. Small ‘flame’ or ‘icicle’ shapes have 2 mm LED - but quite bright ones - inside. Two things: Warnings on the LED light strings state that the wire may be contaminated with lead (that's the metal lead) which is not a good thing. So wash your hands after handling the light strings. The second? REMOVE THE PLUG FROM BOTH ENDS before you start to work. Since the light strings are electrically operated appliances meant to work with 'wall current' or 110 volts you MUST be careful not to leave the plugs on the strings, remove the fuses from those plugs, and discard the plugs in a safe place where no one (mainly kids) can get ahold of 'em. 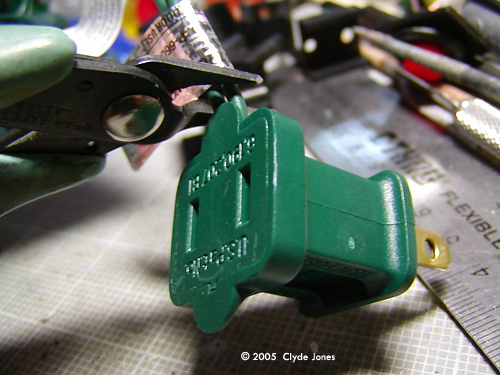 Once you begin to dismantle a string of LED holiday lights, you should NEVER attempt to drive ANY of them with 110 VAC or 'wall current'. Each little LED, or any bunch of them, should be considered just plain, simple LEDs and powered by batteries like any other LEDs. They can stand 'wall current' safely ONLY in their original string as sold from the factory. Attempting to power them from 'wall current' or 'from the mains' would be very dangerous. I can take no responsibility for errors, accidents, injury or damage caused by working with these lighting strings at all. So how do you get them apart? Like the joke says - “Carefully”. The first step should be REMOVE THE PLUG FROM BOTH ENDS. Electrocution is not nice, and you could get fried if someone plugs in a string of lights while you are working on it. Or if they don’t notice that you have been working on it. So REMOVE THE PLUG FROM BOTH ENDS. 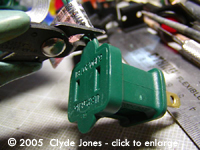 (And save the little fuses inside - they make nice greeblies.) Then destroy the plugs - get rid of them so no one (like a child) is tempted to stick them in a wall socket. I’ve ruined several of the teeeeny 2 mm LEDs by trying to cut the sockets in two with sprue nippers and diagonal cutters. So DON’T. Use a saw. 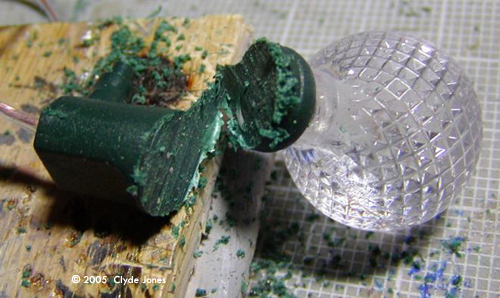 A jeweler’s saw works, but slowly. A coping saw is good, if you’re patient. A hacksaw with an aggressive blade would be better. Personally, I’m wishing for a small band saw to really speed things up. 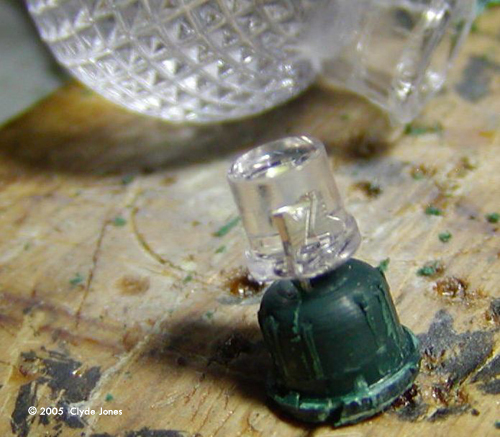 As always, be careful cutting so you wind up with LEDs in your models, not bandages on your fingers. So where to cut? I’ve found that cutting the socket across parallel to the base of the clear plastic ‘bulb’ and a quarter inch (6-7mm) down into the green socket works well. That’s about at the base of the ‘bud’. Cutting there leaves about a quarter inch of lead on the LED, and leaves the solder joint with the lead and wire down in the discarded part of the socket. The LED can then be pulled (GENTLY!) out of the bud. Yeah, it sometimes takes a little convincing to get the 2 mm LEDs out of the buds, but you can use a parts nipper as a pry bar - just don’t cut the leads off the LED while you’re trying to remove it! I’ve had a string of multi-color globes up and plugged in for two weeks as my bathroom lighting as a test. Knowing the ‘usual’ voltage needed by LEDs I thought that these strings of 25 might be getting ‘too much’ voltage each. That makes them brighter than they would be at ‘normal’ voltages, but might shorten their lives. One night, I noticed that one had burned out. Just one. A blue one. And the string is still lit. Now the remaining LEDs seem brighter than they were. These LEDs must have some kind of ‘burn out’ protection that keeps the string lit even when one of the LEDs (that seem to be wired in SERIES) burns out. 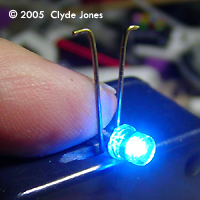 I’m not sure what this means as far as using these LEDs in models, except that it could come in handy if you have a bunch of LEDs in SERIES and one burns out, the rest stay on. If you have a bunch in PARALLEL... I’m not sure what will happen. Perhaps these LEDs should be used as singles or in SERIES sets, not in PARALLEL arrays. Ah, the mysteries of Elek Tronics. If you use these Holiday LEDs in models, and run them at ‘normal’ voltages, they should have the normal longevity of any LEDs. Give the BLUE and WHITE ones no more than 3.6 volts, the others less: 2.4 probably. I’ll do some testing and see just what each ‘needs’. This page copyright © 2005 Starship Modeler. First posted on 23 November 2005.